Today's blog post is deviating from the norm. Instead of focusing on wool we're reviewing a light, summary alternative yarn - Erika Knight's Studio Linen. I've been knitting with it, making the Teatime sweater, during the recent hot weather and it's so much cooler on my lap than wool. Teatime is part of Knight's five new designs using Studio Linen for 2018. 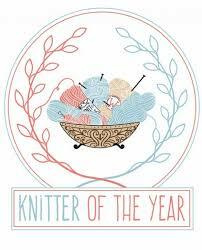 Each pattern is downloadable for £5 at Erika Knight's Ravelry Store. 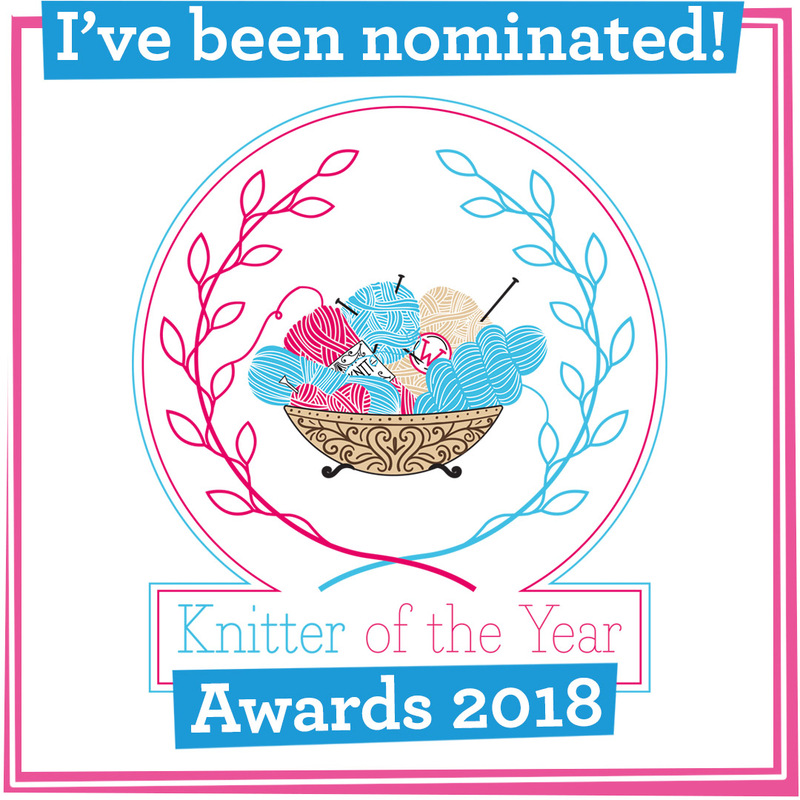 Knight's team told me that "we developed this yarn as we were looking for an elegant summer yarn that would be beautiful in both knit and crochet. 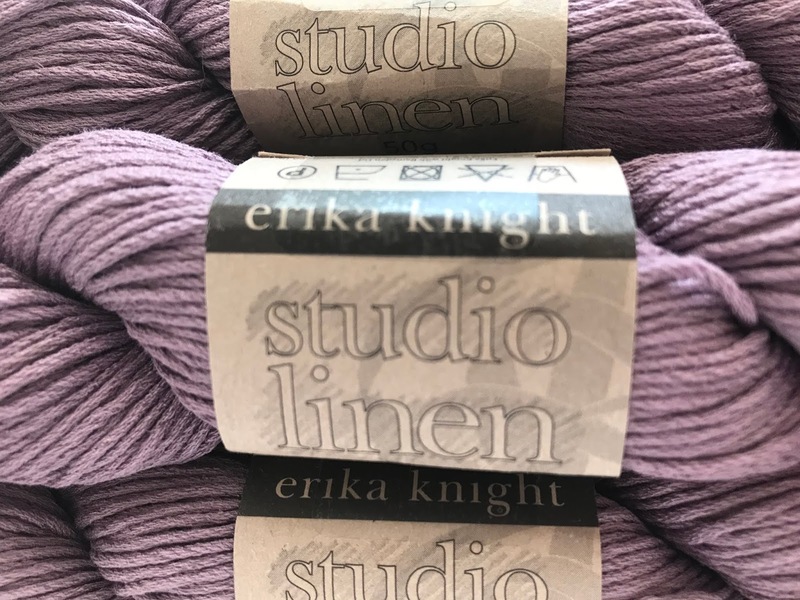 The Erika Knight yarn collection is comprised of all natural fibres ... linen is an ancient, sustainable natural fibre spun from the flax plant. However it can create quite a coarse yarn, which although it creates lovely garments can be tough on the hands to work with. With Studio Linen we have blended 15% premium linen grown in Belgium with 85% recycled linen fibres ... the resultant yarn is much softer than a pure virgin linen." Knight's team also stressed that recycling, sustainability and 'slow clothes', rather than disposable fashion, are really important to the company. There are 17 shades to choose from with each 50g skein retailing for around £5.99. The colour palette is relaxed and muted: think classic greys, lilacs and light shades rather than on trend neons. Four of the colours were inspired by the ancient Japanese resist dyeing technique Shibori, which "mimics the subtle hues of indigo dye." 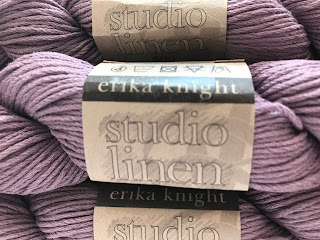 My favourite shade is 'Mood', a relaxing lilac that gives a subtle nod to summer, and Erika Knight sent me the yarn and Teatime pattern to review. All opinions are my own. Teatime is a simple, stylish pattern that won't go out of fashion. I'm knitting the body a bit shorter to suit my figure but am keeping the bracelet sleeve length. When finished I'm planning to wear the jumper with jeans or black trousers. A detail I particularly like is the two buttons around the neckline giving a casual feel. 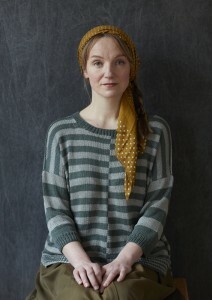 Studio Linen is a pleasure to knit with being soft yet sturdy. The only downside is that the yarn splits quite easily, which can spoil the look of the stocking stitch if you don't spot and correct it first. I'm about two thirds of the way through Teatime now, progress having been held up thanks to a friend's request to knit her more mittens in readiness for Autumn, plus I've also got Wool & The Gang's Total Eclipse sweater knitted in their variegated cotton Out Of Space dyed yarn on the go - another cooler summer knit. Promenade: a casual, oversized sweater (perfect for covering up on chilly summer nights) with a longer back and shorter, bracelet length sleeves. The stripes are eye-catching. Dusk: a hug in a cardigan! There is a diagonal stitch detail on the front and the sleeves. Small Hours: a delightful, t-shirt style top with a v-neck at the back and front. Studio Linen feels smooth and cooling when worn against the skin. Midday: This is a pattern for crocheters. 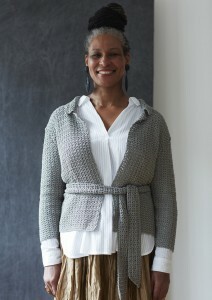 The semi-fitted cardigan has a belt to tie it at the waist. One thing I was pleased to see in the collection was the diversity of models used. The women have a range of ages and skin colour that represent that real women who buy the patterns. It can be frustrating when patterns are only modelled on 25-year-old, 5 feet 8, size 8 white women! All in all it's a classic collection from Knight and, although British wool is my first love, linen is a great choice for Summer knitting.